Gold-Platinum Ratio Set To Crash? The gold-platinum ratio hit a new 20-year high of 1.46x in the first week of April. The two precious metals have diverged dramatically since 2008 when platinum hit an all-time high of $2,251/oz and the gold-platinum ratio bottomed at 0.4x. As seen in Chart 1, the gold-platinum ratio has been rising ever since. While both metals have a similar crustal abundances of 4-5 parts per billion, end use cases and supply/demand dynamics are very different. Jewelry and investment demand (e.g., bars, coins, ETFs) represent over 82% of total gold demand. For platinum, over 60% of total demand comes from the auto, chemical, and petroleum industries. 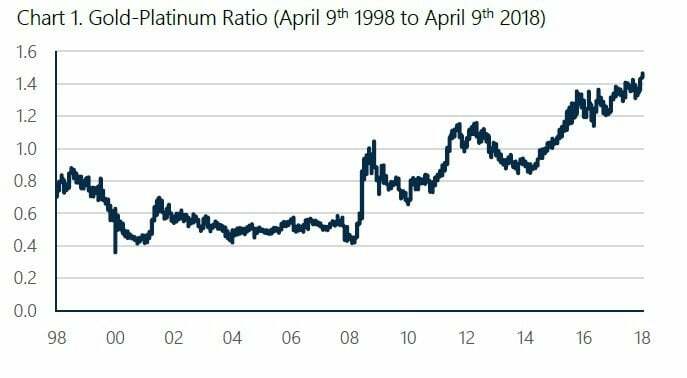 Platinum’s parabolic spike in 2008 was destined to unwind because it was based on unfounded South African supply disruption concerns. Indeed, 2009 global platinum supply exceeded demand. After reaching close to $2,000/oz again in 2011, platinum stands at just over $925/oz today. This descent has been rooted in fundamentals. Over this period, total platinum demand has fallen from 8.1 Moz to 7.8 Moz, driven primarily by weak jewelry demand. Platinum ended in surplus for 2017 as demand fell 4.5% from 2016. Investment demand has fallen over concerns about future autocatalyst demand after the European diesel emissions scandal and the rise of hybrid and electric cars. Meanwhile, over the same period, gold, buffeted by central bank buying and steady jewelry demand, has meandered around $1,300/oz. $1,000/oz, and well below the marginal cost of production, supply growth will be muted. Anglo American Platinum, the world’s largest platinum producer with a $955/oz all-in sustaining cost, recently commented that future production growth will be limited. Historically, commodities have typically traded at a minimum of 40% above their all-in costs. On the demand side, continued global growth will drive industrial platinum demand (industrial demand has been growing at 2.8% over the last five years). Stricter automotive emissions standards, especially from China, should bolster automotive demand. If fuel cell investments continue on their current pace, any decline in diesel demand due to the European emissions scandal will be offset. Fuel cells require approximately 1 oz of platinum to strip hydrogen of its electrons compared to less than 4 grams required per gasoline or diesel vehicle. Japan and China are making significant fuel cell investments for both transportation and power applications. Even after factoring in stagnant diesel demand, Anglo American Platinum expects annualized automotive sector demand growth of 2% through 2024. Weak jewelry demand and subdued investor interest could keep platinum below its all-in sustaining cost over the short term. Historically, numerous commodities have experienced periods of time below all-in sustaining costs or marginal costs. Interest rates, inflation expectations, and other macro variables outside of supply/demand dynamics can also play a big role. However, we expect platinum to ascend from these depressed prices over the next few years just as oil rebounded from uneconomic levels over the last two years.